This MOD will make the game harder! Focus on Weapons research and getting good defenses up! - It also gives you a couple new buildings to help you fight these changes and stay alive! Bob's - YES! I love Bob's. That's what I'm playing with. Recommended actually! The main goal of this MOD is to try and make the enemies harder as the game progresses. I found the vanilla game a little too easy and wanted to make the game a little more challenging. So I created this MOD, to give me a little more challenging game experience, especially towards the end game. The theme of the MOD is that Pollution really affects the aliens a lot. They are not use to industrialization and having their ecosystem polluted. You will actually do very well, if you play a “Green” game, using solar and minimal pollution. Pollute and face the consequence! It’s also mainly intended for people who want to play a longer game and spread out to reach distant resources. Time Evolution Factor reduced by 25% - From 0.000004 to 0.000003 – Gives you a more time. 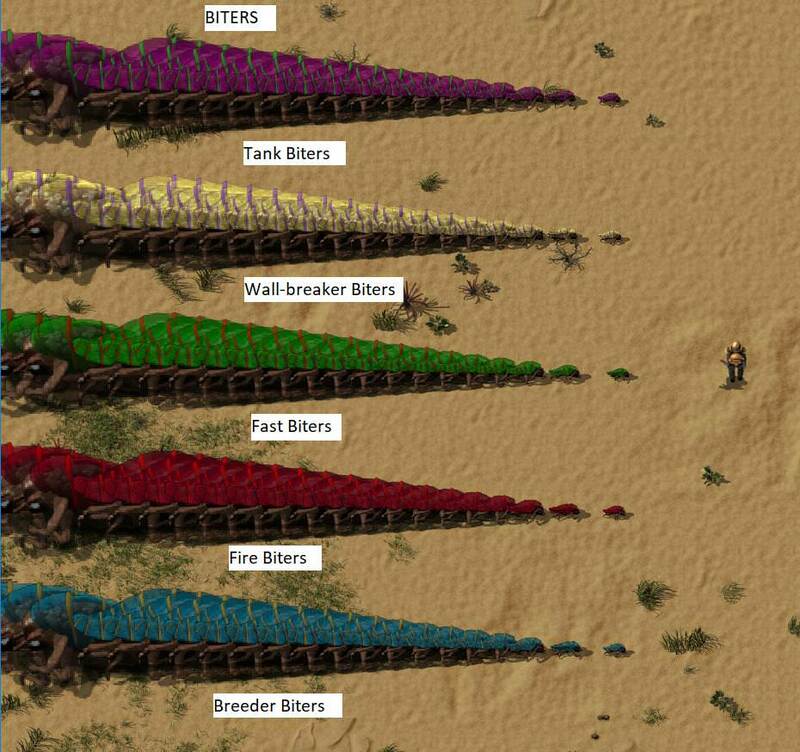 Pollution Evolution Factor 2x vanilla - From 0.000015 to 0.000030 – You are penalized for polluting this beautiful alien world! Recycle! Focus on a green factory or the Evolution rate will get out of control. As the Evolution goes up, the Expansion will get more aggressiveness and the enemy will be able to settle closer and closer to your base. The number of enemies in the expansion will also go up. Once you build the Rocket Silo, expect a lot of enemy attacks! Each time there is a new expansion wave you can expect biter to try and take out your rocket silo. Terraforming Station – A radar-like building that slightly reduces the evolution each time a scan is completed. Each consecutive Terraforming Station is 15% less effective than the one before. This will prevent it from being overpowered. Thumper – A radar-like building that attracts nearby enemy units upon scan complete. 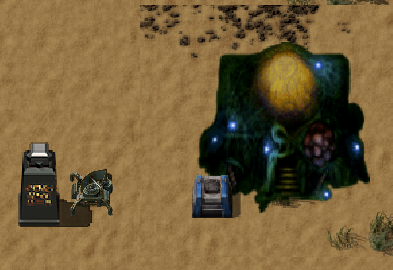 Alien Control Station – A radar-like building that has a small chance of converting enemy units to your side each time a scan is completed NOTE: Once placed, if mined, you'll lose the Alien Artifacts used to build it! By default, it's set to HARD., so set it to Normal if it's your first time using the mod. 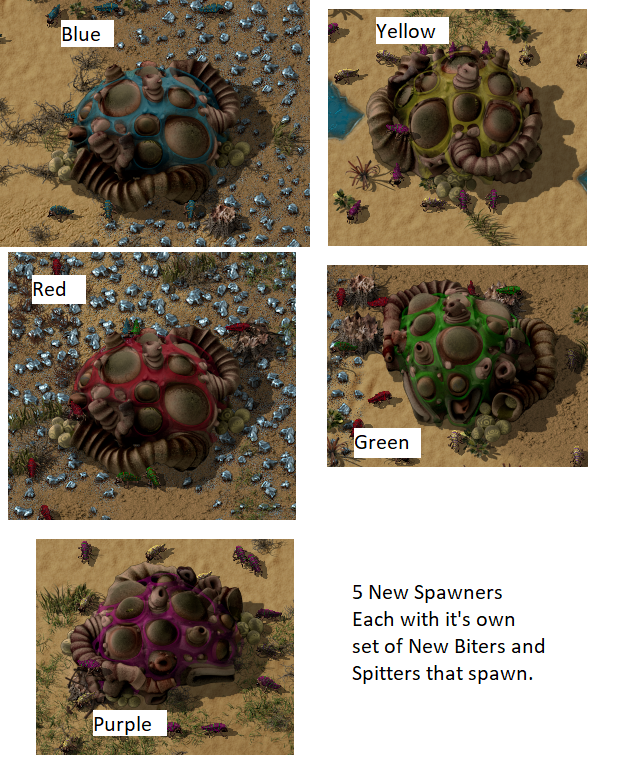 Spawners have a lot more health and more units around them. Every 5% of evolution a new type of enemy will appear. 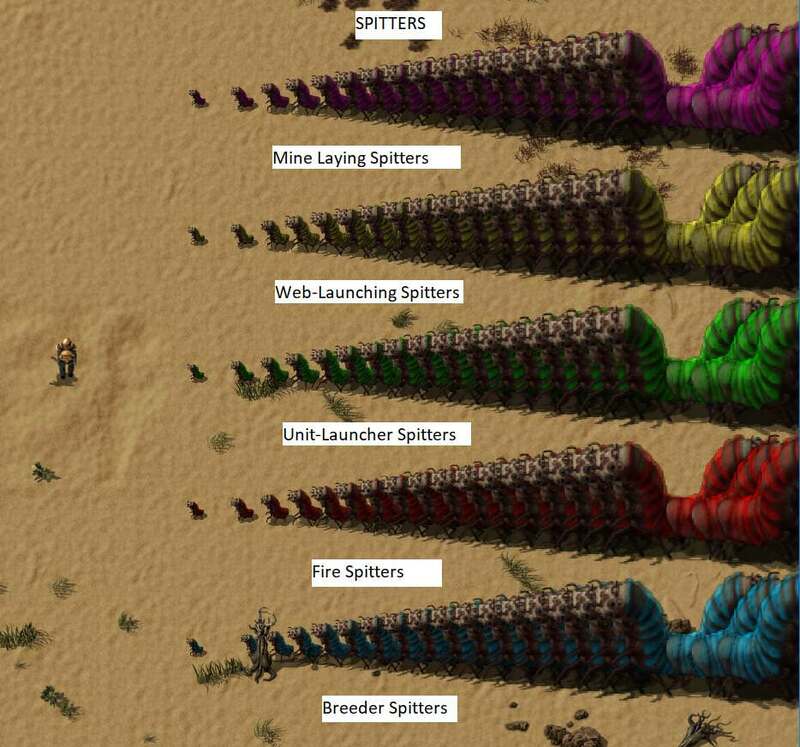 Biters starting at 0% and Spitters start at 5%. The enemy resistances are also all increased, so prepare your defenses! Unit attacks have also been altered. 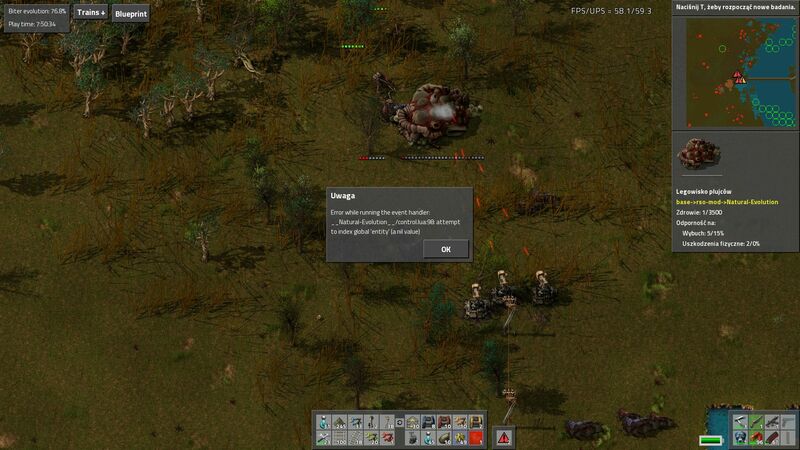 Infected units attack with poison and Mutated units attack with Acid. These have been added to the Vanilla spawners. The below chart is slightly out dated, but give you the general idea. Each 5% a new enemy type appears. 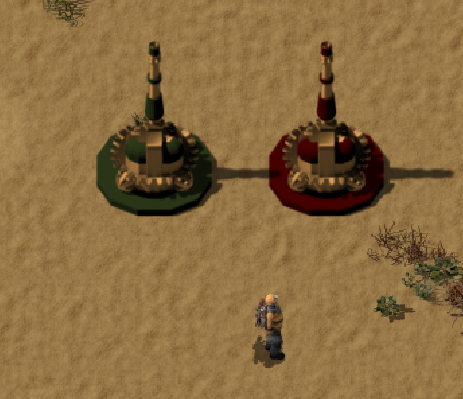 Medium and Large Worms now also launches units at you. It takes less pollution for enemies to start attacking you. The enemy waves of attack should also get larger over time as I increase the radius of units gathering to attack as the evolution factor increases. Building: Artifact Collector - Collect all those small Artifacts. They are also Passive Logistic chests, so use bots to collect the artifacts from them. 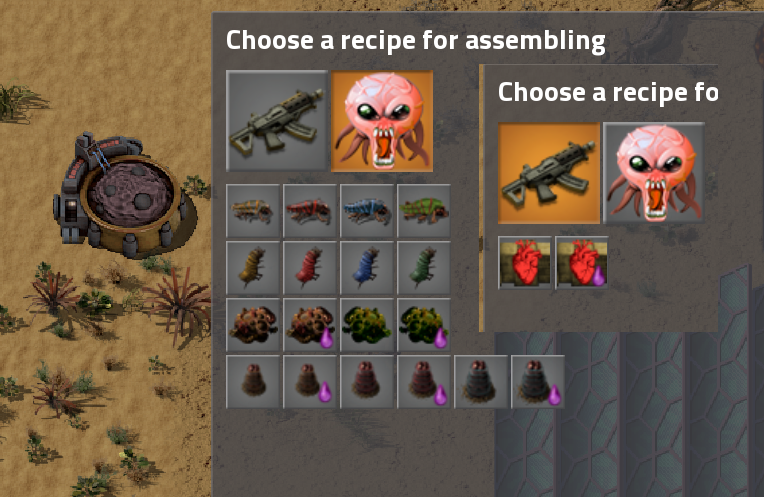 Item: Biological Ammo, made with Alien Artifacts and are deadly to the enemy! 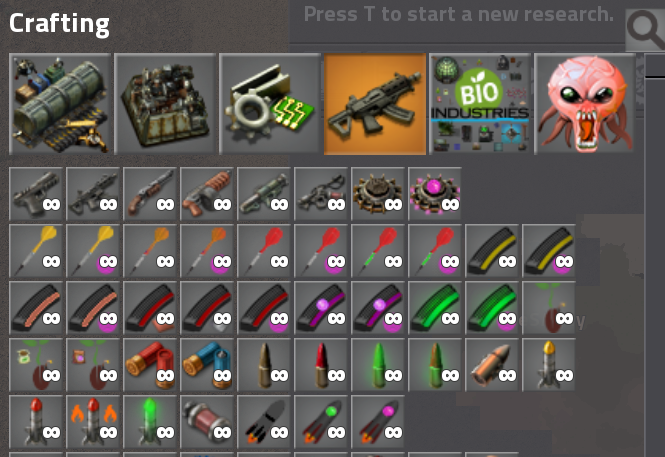 Just put the zip folder in your mod's folder, no need to unzip. RSO – Better resource spawns – Though you should up the default number of enemy spawns in RSO. 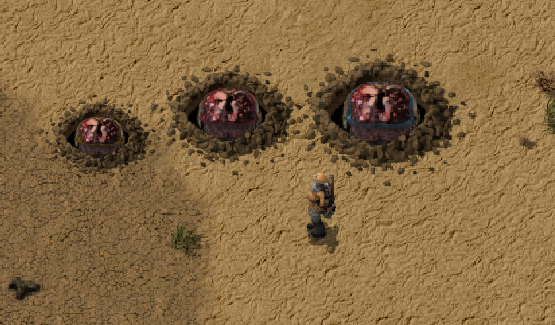 Bobs Enemies – adds more variety to the enemies. And can be used as a standalone. Evolution Factor Indicator - Helpful to know your current Evolution Factor. Chlue - He has helped with a lot of code tweaks. ThaPear, Semvoz, Billw, Adil, Rseding91 Chlue - Coding help! Bobingabout - Bob's Mods - Learned a lot from looking at your amazing work. Last edited by TheSAguy on Mon Apr 15, 2019 10:52 pm, edited 172 times in total. Re: [0.12.x] Natural Evolution v3.0.5 - All things Alien! Please let me know if anyone has any errors, I have not thoroughly tested it yet. Don't have the time right now. Last edited by TheSAguy on Sat Jul 18, 2015 9:25 pm, edited 1 time in total. 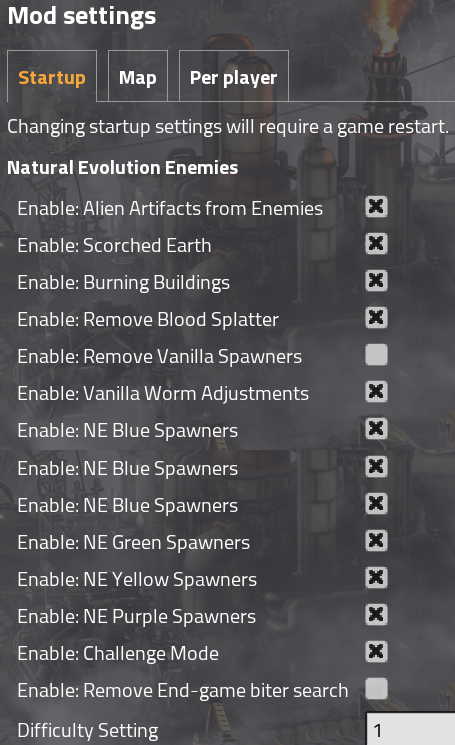 Re: [MOD 0.12.x] Natural Evolution v3.0.5 - All things Alien! Re: [MOD 0.12.x] Natural Evolution v3.0.6 - All things Alien! Disabled debug mode. Was using if for testing. About to give it a try. Adding it to the modpack for 0.12! tell me if you disagree. Having a problem here. When I destroy the first enemy base the game crashes. Any idea whats going on? darkshadow1809 wrote: Sounds like a beautiful mod dude Thanks for making this! darkshadow1809 wrote: Adding it to the modpack for 0.12! tell me if you disagree. Sure thing, note that the Alien Control Station is not currently running. Almost got it working though. Same issue in MP. Disabling the mod allowed us to carry on, but I'm worried it will be too easy now! I will try enabling again tonight, when I get the crash I will try and fix it and post here again. I re-uploaded the file - fixed up the biter base problem properly. I'm pretty sure it doesn't work like intended still but it won't crash. Obviously I am playing MP! The result of ignoring this on both clients is that the bases don't die, they flicker at minimum health but stay alive. According to wiki game.player is for single player only, it needs to use game.players[<index>] in multiplayer. Instead I think this should be using the owning or acting player in each instance. I will try and rough out the code now. Okay I modified this to use the force of the converter building to set force of converted spawners. I no longer get any crashes where I did before, although I was playing multiplayer but on my own (I will test more tomorrow when I have someone to play with). I'm only uploading this to help the author, it is obviously not my own work and will be taken down when/if asked! As I didn't say this already: thanks for this mod! It makes multiplayer much more fun, two of us required to take out spawners rather than just 2 shotting them with the tank. 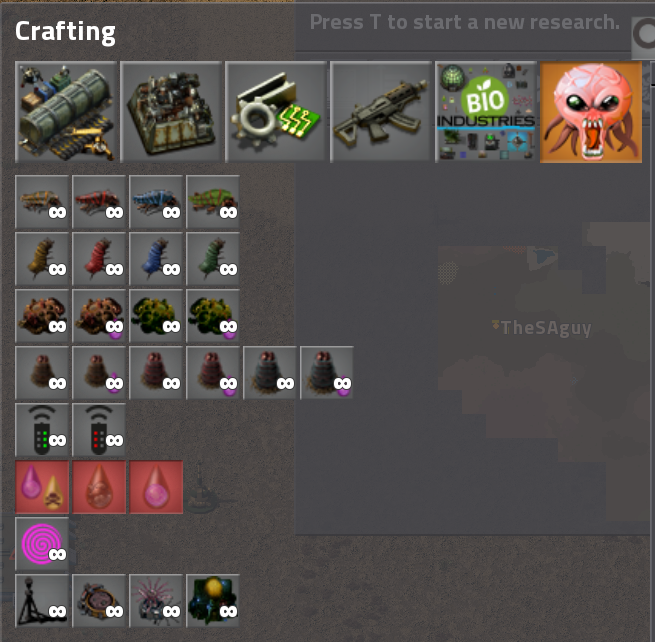 Re: [MOD 0.12.x] Natural Evolution v3.0.8 - All things Alien! Sorry for the crashes and late response guys. Had my hands full with RL and will probably have more to come. I've posted an updated version that removed the Alien Control Station all together for now, until I get some more time to review. Thanks to billw and orzelek for trying to help in my absence. I'll review what you've done and hopefully if will fix my errors! Please give the new version a try and let me know if you have any errors. I've never done MP, so let me know if it works there. P.S. The latest version also looks at the latest DyTech and Bob for v0.12 and makes a few adjustments if you're using those. billw wrote: Okay I modified this to use the force of the converter building to set force of converted spawners. I no longer get any crashes where I did before, although I was playing multiplayer but on my own (I will test more tomorrow when I have someone to play with). Give the attached one a try, it might work with your edits. I don't currently have the time to test. I just had a look at the code I see an error. I will test at lunch time. 3.0.9 is still missing two instances of event. Lines 98 and 99 both try and reference entity directly when it should be event.entity instead so I don't think orzelek's patch got fully implemented. When an enemy spawner is destroyed it looks like it is supposed to convert everything in the area based on the name of the function that it is calling, the only problem is that the function that it calls (Convert_Base) takes three parameters and line 99 is only providing the first two. Without the new force being specified you still get a crash. That said I don't really understand why destroying an enemy spawner should cause all other enemies in it's vicinity to come under your control, but I am probably just missing something. Also the way that surfaces are being handled, particularly with the mind control stuff that is still in place could be really exploitable with other mods. Currently it is being hard coded to always check the default surface for enemies instead of just using the surface in which the beacon is located. From the testing around that I have done entities know what surface they are on so there is no reason to hard code things to use a particular surface. Granted that is not to say that you can't prevent things from being used in/on a particular surface. JLBShecky wrote: 3.0.9 is still missing two instances of event. First off, Thank you for taking a look at the code!! I really appreciate it. I have a newborn due anyway and just don't have any time to test at the moment. Billw's main goal was to try and make the mod work in MP. I've never tested it there, so have no experience with that. I have attached v.10 with some of the stuff you'e pointed out. Billw. Thanks you also for helping you!! 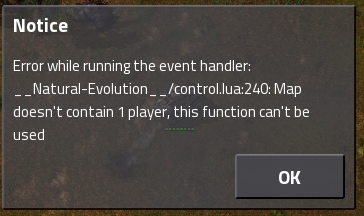 The 1st post 3.0.8 has small error in control file with defining non existing function for events. Attaching fixed one in here. orzelek wrote: The 1st post 3.0.8 has small error in control file with defining non existing function for events. I replaced the file on the main page, don't have time today to do much more.